Make more room to carry your sports gear with OEM authorized Mopar 82211335AC sport utility bars designed to fit roof racks on Jeep Liberty model years 2008 through 2012. 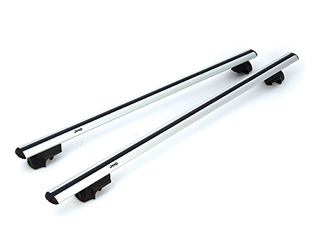 These sport utility bars from Just for Jeeps for your Jeep Liberty roof rack cross bars will fit a roof rack for a Jeep Liberty 2012 model, for your 2008 Liberty or for your 2009, 2010 or 2011 model. These sport utility bars mount to your factory-installed roof rack to expand your carrier capacity from32 inches to 50 inches. Once they're installed, you can add other roof top carriers designed to carry water sports equipment, bicycles, skis, snowboard or other sports gear. These corrosion-resistant Mopar sport utility bars have T-slots that allow for easy, fast carrier installation.� Please note that this Mopar set of sports utility bars is not compatible with Liberty Jeeps with Skyslider roofs. 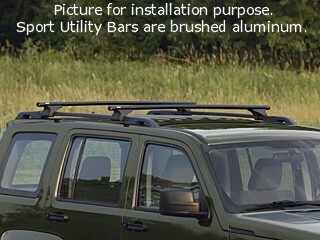 The brushed aluminum bars mount to your production side rails on your Jeep. They will allow you to carry up to 150 pounds in a maximum rack load made up of the dead weight of the roof rack, the accessories and your load. Now you don't have to decide whether to take sports gear or not, and you'll avoid having to rent an expensive, unwieldy trailer to pull along. Carriers that allow you to take more than one set of sports gear also leaves more room inside your Jeep for fellow adventurers. After your sports bars and carriers are attached, we recommend that you double-check after driving a short distance and at regular intervals to make sure your load is secured.� An unevenly distributed load will change your Jeep's performance on the road, so check to make sure your load is evenly distributed over the surface of your sports gear carrier, utility bars and roof top before your departure. Shop our bargain prices at JustForJeeps.com for all your Jeep Liberty parts and accessories. Learn why we win top rankings year after year for superior customer service. Brushed Aluminum, mounts to production side rails, includes T-slot for Carrier installation. NOT COMPATIBLE WITH SKYSLIDER ROOF. Other products did not fit and looked cheep, will use justforjeeps.com again . Perfect fit, easy to install and they lock. What more could you ask for. Instructions are very poor. PUT SOME WORD WITH PICTURES. This review is for the service I received from Just For Jeeps. The product is a Christmas gift and hasnt been opened yet. I called customer service and they were friendly, knowledgeable and very helpful. And the product shipped out the same day. Thank you! pretty slick, looking to get the locks now. I had these for my 2012 Liberty.